We all have different skill sets, and we all battle different obstacles. Some musicians find it difficult to deal with technology; it hinders their ability to be creative in the recording process. Others are capable of producing radio-ready instrumental tracks because working in a DAW, like Logic Pro, is a completely native experience to them, but struggle to fit vocals in. The DAW presents an environment of infinite possibilities — but all the options can create serious writer’s block. Singers and instrumentalists can feel overwhelmed at having so many options in front of them, and producers can find themselves focused more on creating specific sounds than on the needed melodic, harmonic, and lyrical elements. Songwriters tend to take form and structure into consideration from the start, while seasoned producers and beat makers will think primarily about managing the energy flow and momentum of a song. Songwriters may dig deeper into their own emotional state, whereas producers may seek to enliven and excite the emotions of their listeners first and foremost. For the songwriter, effects and sound design remain in service to the message of the song throughout the process, whereas for the producer, these are central aspects of the song and its message. In other words, there’s a clear distinction between the priorities of a writer and a producer, and how they tend to navigate the creative process. Whether you prefer building a beat first and a top-line melody next, or laying down a harmonic structure and focusing on arrangement later, it’s all about working methodically with a plan, contemplating the end product, and keeping track of any ideas that pop up in the process. Here are some tips for making the song production process a bit more manageable. 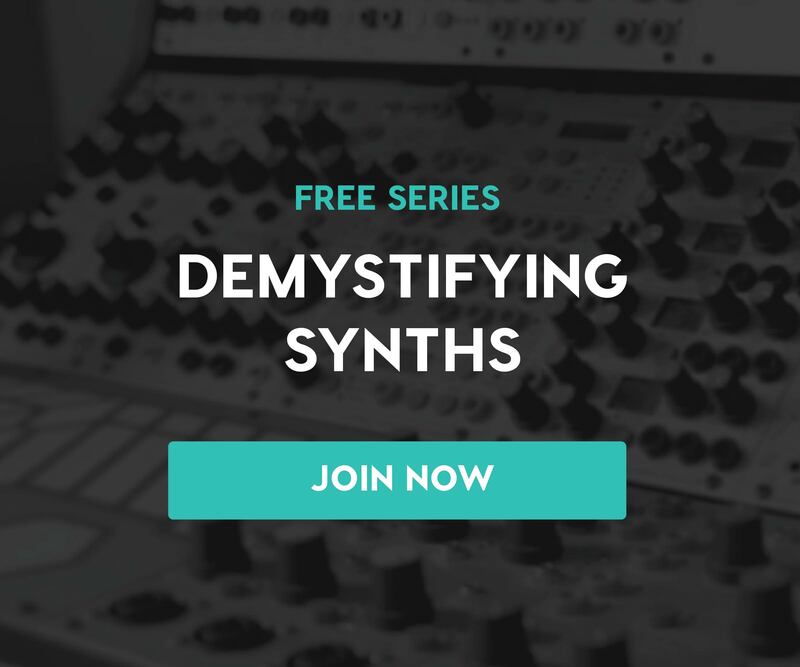 If you’re a songwriter who is new to the wide world of electronic music production, consider our six-week online course, Songwriting For Producers. Your personal mentor will help you learn the ropes of pro songwriting techniques and develop workflows in a way that works best for your music. Think like a producer, one who is always searching for samples and sounds to add to their growing library. Instead of waiting until the moment you start making a track, keep a notebook full of your lyrical ideas, even if they are just a couple of lines: something that strikes you as intriguing, something that rhymes, or even words that don’t rhyme. Try free-writing exercises! If something made you stop and think or feel uneasy today, write it down and let your ideas flow from it. Or, focus on an object in your house that carries a lot of meaning and see where your memories of that object take you. Perhaps you recently held back saying something you wanted to say to your friend. Scribbling away on pages they’ll never read may help you collect your thoughts. It doesn’t have to be a journal that you religiously update — getting into the habit of writing down any ideas that you may have while you’re going about your day will save you from a writer’s block later on when you sit down to make a song. 2. Focus on song structure from the start. I’m not about to pretend that all songwriters know if the song they’re about to write will have a pre-chorus or a bridge before they even come up with the first line. But we all know most songs at least have a verse-chorus or verse-refrain structure, right? Even if you’re aiming to have a big instrumental drop somewhere in the middle, in most cases, you’ll still need a verse and a chorus to get there. So, next time you find yourself with a clear vision for a track, but your arrangement ideas are lacking in intent, take a moment to focus on the big picture and revisit your song’s structure. If you need to, put markers into your track and build the song around them. 3. Don’t be afraid to sing. Even if you can’t sing, you can use tools like a vocoder, talk box, and Auto-Tune to add top-line melodic ideas into your song for an eventual guest vocalist to use. Trust me — even if you’re shy, your guest singer will greatly appreciate your efforts towards making your ideas clear to them and the recording session will be an infinitely more efficient one. Doing this also helps you start to think like more like a singer, which is a crucial element to improving your songwriting process. The more you practice writing songs in your DAW, the more you’ll find yourself coming up with ideas that you can easily import straight into a track. But if those ideas come to you while you’re on the go, make sure you have a way of saving them for later. It’s like unlocking a part of your brain you never used before! Just like keeping a lyric book, voice memos on your phone can be extremely useful when you want to write a song, but you don’t know where to begin. Whether I am writing a top-line for an EDM producer, or I’m a more embedded part of the writing process, I always attempt to clarify the theme of the song early on to speed up the work. What are we trying to say in this song that we’re about to write? Is it a breakup, or a loss, or the joy of feeling content and being in love? Are we trying to initiate an uplifting mood or is it going to be a more sombre vibe, instead? Even if you’re working alone, with ideas rapidly emerging in your brain, choosing a theme early on and focusing in on it actively will help you create a song that translates well to any listener. Teaching yourself how to produce is not so different from teaching yourself how to write or play a new instrument. It requires practice and patience. All you have to do is take that first step out of your comfort zone and the ideas will soon start pouring in! All of our mentored online courses come with six weeks of 1-on-1 professional coaching and feedback on your work. It’s like having a personal trainer, but for music! Whether you’re interested in taking a deep deep into production-related topics like Advanced Mix Techniques, Intro to Making Music in Logic Pro X, and Songwriting For Producers, or just want to work with a Mentor directly on a personal project, we can help you reach your musical goals!